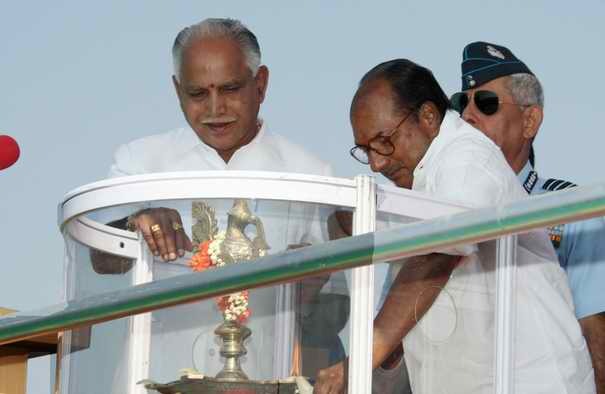 Defence minister AK Antony lighting the lamp to inaugurate the Aero India 2009. Also seen in the picture are Karnataka chief minister BS Yediyurappa, and Indian Air Force chief Air Chief Marshal FH Major. Aero India 2009, held in Bangalore from February 11 to 15, captured both the dull global economic scenario and India's booming defence budget. While the military aerospace manufacturers from within India and abroad showcased their products in large numbers, the civil aviation participation was almost minimal. India's prestigious brands including the Indian Space Research Organisation and Brahmos were there, along with the DRDO (Defence Research and Development Organisation), defence public sector units such as the Hindustan Aeronautics Limited and others. During the Aero India, HAL handed over five of the Advanced Light Helicopter Dhruv ordered by the Ecuador Air Force. In the picture, Dhruv aerobatics team Sarang putting up an impressive display for the audience. The show stopper at Bangalore was India's own indigenous Light Combat Aircraft Tejas. Despite the long two decades of development and problems, the LCA received the most amount of applauds at the inauguration. Defence minister AK Antony said, “I am excited to see our own LCA” do maneuvers. Air Force is set to induct a squadron of LCA, and a global hunt for a more powerful engine for the indigenous fighter is underway. Indian Air Force's SU-30 MKI stunned the crowds with its agility, advanced maneuvers and sheer power. Several key figures from politics, business, military, scientific world and bureaucracy were at the Aero India. In the picture, Ratan Tata at the inauguration. Several foreign participants flew in military fighters, tankers and transport aircraft as they vied to showcase their products, especially those competing for Indian Air Force's $10 billion multirole medium range combat aircraft (MMRCA). In the picture, a C-17 Globemaster of the US air force. The Surya Kiran aerobatics team of the Indian Air Force in the backdrop of the ALH sold to Ecuador.